From a notice in the Newport Daily News of October 1875: " Mr. Theodore Helme is about to erect on Spring Street a building, the lower part of which is to be devoted to business purposes, and the upper part for a residence. The old buildings formerly occupying the site, have been removed to the rear of the lot, and will be repaired and made use of for tenements." This is the only reference we know of about our building which authenticates the construction time of 1875/1876. Take a tour through our home with before and after pictures. 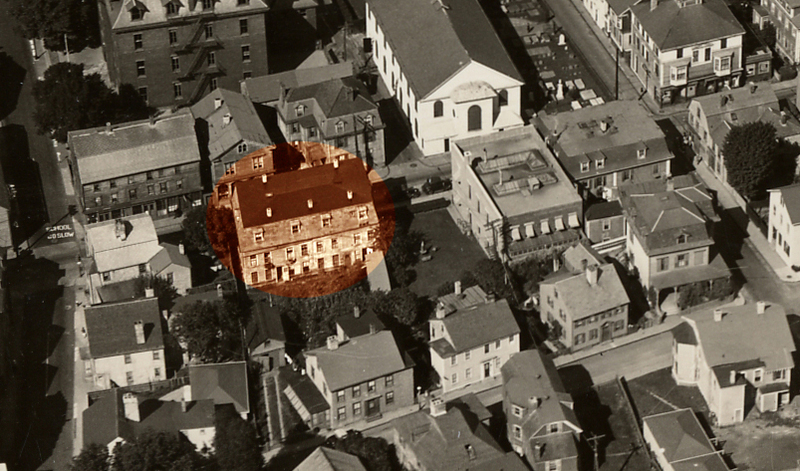 The above image was taken in 1936 and is an aerial view of our building (the sepia toned oval). Across from us on Spring Street next to Trinity church were commercial buildings; they have been demolished and there is a park on that site. The telephone building next to us on the right in this image has not been expanded and there was a park next to us. Most of the homes in our area are still standing. The street in the foreground of this image is Division Street and the Streets on the left is Mill and on the right is Church with Spring in the center parallel to Division. LIGHTING: CHANDELIERS, WALL SCONCES, SOLAR, SINUMBRA, GAS, KEROSENE, GAS SHADES, ETC.